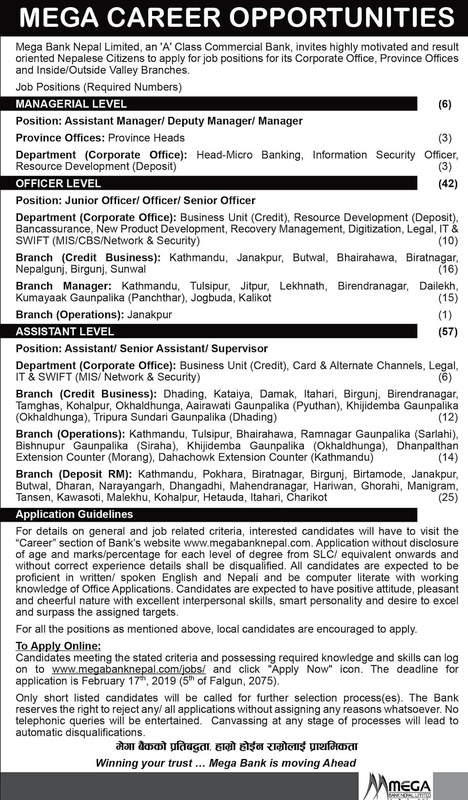 Mega Bank Nepal Limited, an 'A' Class Commercial Bank, invites highly motivated and result-oriented Nepalese Citizens to apply for job positions for its Corporate Office, Province Offices and Inside/Outside Valley Branches. For details on general and job-related criteria, interested candidates will have to visit the "Career" section of Bank's website www.megabanknepal.com. Application without disclosure of age and marks/percentage for each level of the degree from SLC/ equivalent onward and without correct experience details shall be disqualified. All candidates are expected to be proficient in written/ spoken English and Nepali and be computer literate with working knowledge of Office Applications. Candidates are expected to have a positive attitude, pleasant and cheerful nature with excellent interpersonal skills, smart personality and desire to excel and surpass the assigned targets. For all the positions as mentioned above, local candidates are encouraged to apply. Candidates meeting the stated criteria and possessing required knowledge and skills can log on to www.megabanknepal.com/jobs/ and click "Apply Now" icon. The deadline for application is February 17th, 2019 (5th of Falgun, 2075). Only shortlisted candidates will be called for further selection process(es). The Bank reserves the right to reject any/ all applications without assigning any reasons whatsoever. No telephonic queries will be entertained. Canvassing at any stage of processes will lead to automatic disqualifications.